It has been a productive day and a day where I decided to focus on my own work rather than the needs of the group. That is not always an easy thing for me to do, but it is something I should learn to do more often, or at least more effectively. One of the syllabi for the Spring is completed and the course shell for the course will be done yet today. The specific act of solitude today is also something that is relatively new for me. While I have noted for some time that I have learned to appreciate, perhaps even crave, my alone time, there are moments I ponder the consequence of it also. Over the past few days, as those on Facebook can attest, I have posted a couple of scanned photos from my earlier (and some have reminded me “much earlier,” – thanks Michele Meier) lives. I note lives because I am often questioned about how I have done so many different things. I guess I have not really considered it all that different, but rather a sort of a continuum. There is always the need to be looking at or preparing for what is ahead and simultaneously we are reminded of our past and connected to what has made us who we are. The past couple days I have begun to take stock of what matters most to me, what it is I most value, but also to ponder those things that might have been. I am not sure if it is a growing old thing or if it is wondering at times how it is I am where I am (well I do not it is some of that because I am certainly not where I expected to be, but I do not say that in a regretting or lamenting manner). If I were to address the things that are most surprising to me, the first is this solitariness that characterizes me personally. It is more than merely being single, it is a matter of wondering at times where I belong or where I fit. I have always been, and certainly more than most realized, including myself, the lonely-in-the-middle-of-the-crowd person. I have fit in many places, but often felt like I fit in no where. Generally, it is not something that bothers me, at least, when I am not thinking of it, but there are times like now when I wonder what might happen to me, and for whom that might be an issue. This is certainly not a call for pity or others to tell me I am valuable, so please do not worry. One of the things I have been able to do in three score and one years is understand my strengths and weaknesses, and be pretty comfortable with who and where I am. I guess this is more a pondering of what if something different might have occurred. If you have read this blog with any consistency, you are probably aware that I get in these rather pensive moods, where I need to figure it out, even when, perhaps, there is nothing to figure out. I can see Melissa staring at me now and then shaking her head. It is that melancholy underpinning that seems to be part of my make up. While I did not get married until later, even then, what I know now is perhaps I was not ready to be married, but is one ever?? What would it mean that you are ready? What I know now is that my first marriage to Susan was done because I thought it was the next reasonable thing to do. That is not her fault in any way, it is mine own. I do believe perhaps the happiest time of being married to her was when we were first in Omaha Village and actually pretty broke, but we depended on each other and I think we believed things were as they were supposed to be. Yet, what I know is the summer before the wedding my CPE unit had raised serious doubts for me in if I could ever be a good husband or father. Perhaps I should have postponed and thought more. There was also my own struggle to understand what it meant to love someone in such a way. I know what I often told couples as a pastor, that the love they had the day of the wedding, which seemed so amazingly complete, was not nearly enough to see them through the remainder of their lives. It is something that has to mature, be tested, and endure. I can say that, but can I do it? I am not sure I learned how, but then again, it is by example or is it from something inside of you? Yet, there was, as many know, a second marriage to Theresa, and if I ever believed I was in love with someone, it was her. She pushed me away more than once, but I returned on both ends of that marriage. Many, to this day, call me a bit deluded for staying involved as long as I did, but then again, I am at fault for a number of things in the failure of that marriage. Yet, significant time has passed since being involved in either situation. In fact, from the time that I left almost 17 years. In my blogs I have noted that sense of did I expect to be here at this point in my life, and the answer is a pretty unequivocal “no.” Yet, what did I expect, or do we have the right to expect anything? I want to offer a shout out to a few people who give me hope. My undergraduate classmates, Keith and Kathy, Paul and Lisa, Scott and TC, Mark and Kay, they have all made it, so to speak. I know there have been health issues and significant things that I am sure have tested them, but they provide a sense of hope for me. I admire each and everyone of them. I am not sure how I would even begin to think of being married to someone at this point. I did spend significant time here in Pennsylvania with someone I have known for 30 years now. She is a wonderful and beautiful person, but both the distance and commitments seemed to be hurdles larger than we could manage. I wonder if I was perhaps meant to be a single person. Certainly the last decade and a half has taught me how to be on my own and manage it. Certainly a job that consumes me (and I am always astounded by my colleagues who manage families and the academy) does not seem to offer much option to take on something else, and yet there are times I believe it would probably create a better sense of balance than I currently have. Perhaps it is really a combination of circumstances, inability, limitations, and a lack of knowledge or skill. There are two or three people in my life that have so totally amazed me, and that somewhat complete astonishment has continued over the decades; the four person fits that category, but I have already confessed that failure. One goes back to early in my life, one from when I was in college and one after being gainfully employed. In each case, I can imagine the proverbial growing old with them, but such an imaginary journey is not a reasonable expectation for a variety of reasons. First and foremost, none of them live in Pennsylvania. I also think there is an issue of imagining the person as you remember them versus what might be their present reality. There is only one case where I believe I have a reasonable understanding of the other, but there is still an issue of distance and the need for someone to make a significant change, or that one occurred. All of those things would be hanging on to a dream, and that is certainly not reasonable. I wonder if sometimes, my baring my inner most fears causes others a sense of fear or vulnerability. For me, I do not feel vulnerable, it is freeing to ponder and wonder all of this through my fingers. What it seems to me is that as I have entered this decade, one that I am not completely sure in a more profound manner I might not finish, I find myself reflecting more on the what ifs of my life. I have noted if I could go back to school, doing it over, I would probably go into linguistics and cultural studies (focusing on languages). That is not something I grew up ever imagining. I was never encouraged to know another language or consider life outside of Iowa. There are times my Midwestern heritage still stands strong and I miss the friendly nature of those who I grew up or where I lived in both Minnesota and Wisconsin. It has been too long since I have made my way back to Sioux City. I did make it to about an hour away late last March. I want, desperately, to get back there, perhaps at the end of the academic year and before summer school. I also have noted the significance of having a very different understanding of what seems important, even paramount, to me and how that differs from earlier in my life. I have learned that I am more of a walking oxymoron that I have perhaps realized. While I am profoundly patriotic, I am more globally influenced and enamored than I was ever aware. While I love to travel and learn, I am wishing, even as I sit here in Poland, once again learning phenomenal things, I would be more content at this moment sitting in my house. I want to learn more and more and keep working, but there are moments, where I wish I could merely retire and relax. I wonder if all people my age wonder some of this. Perhaps I am not as far out there as I sometimes think. Well . . . so how do I answer my question. I am sure that where I am is a consequence of a decision, or a couple of major ones. It is also the consequence of things that were, and are, part of my flawed humanity. It is my humanity and its flaws that still stupefy me at times. I wish I could manage all the flaws, which seems contradictory of me saying I am comfortable with my weaknesses. What it says is I understand the some of the reasons for the flaws, but I wish I understood them more completely. Perhaps it would be possible to change some of those things, but for the time being, it simply is. 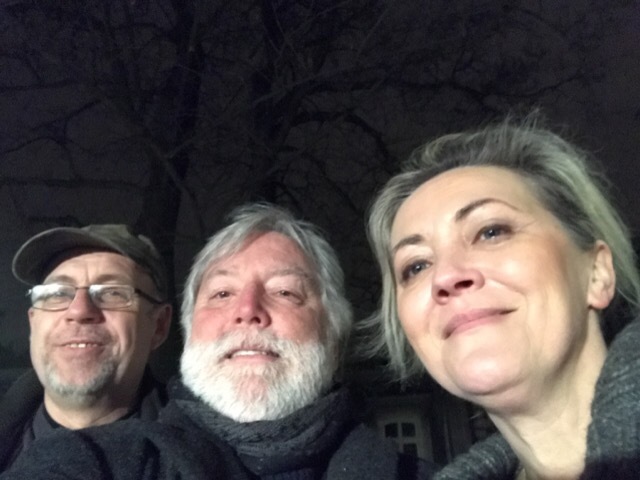 It is now late evening and I am about to sign off, but I had the most wonderful dinner this evening with Robert and Katazyna. I am very blessed to have them here in Kraków when I come here. It was wonderful to see the progress made since two years ago and it was wonderful merely to catch up and spend time. I am looking forward to seeing them again. In the meanwhile, I will continue to ponder and wonder some of my what ifs and merely keep on. As that is what we do. The morning was a traveling classroom and lecture and visit to the Galicia Jewish Museum. It was, again, a second time for me to visit this museum and listen to the lecture of Jakub (Kuba) Nowakowski’s informative and moving lecture on the history of the Jewish Resistance in Kraków, and his stories about the young people who decided stranding up against the Nazi occupation, in spite of the overwhelming likelihood they would be killed, was better than merely being treated in the subhuman manner the Nazi’s characteristically used. Alexander, her main partner-in-crime, Clarissa Hoke, a nursing student as well as an honors student, and I went to dinner at a Georgian Restaurant and spoke about the Jewish question, which is the underpinning of one of our classes. It is typical for all, but perhaps more so for students because they are farther and farther away from the actual time of the Holocaust, to ask how is it that the Final Solution regarding the Jews could be implemented by a country of such cultural heritage and the people did not ask more questions? How it is German peoples, from whom or where we get some of our most amazing biology, chemistry, music, art, literature be convinced that a certain group of people, with a particular religion, were the root of all of their problems? How could they with such an intellectual or educational background be almost duped into believing that the removal and killing of six million people was the answer to their hyper-inflation, their national identity, their struggles from being blamed for the First World War? For most of us, there is little logical about that. However, is there ever logic that creates a foundation when a group of people regardless their religion, race, or gender is used to decide their fate? Throughout the class, the question that is again pushed to the forefront is what happens with the minority of a society seems to run amok of the expectations of the majority? Dr. Orla-Bukowska continually pushes students to consider this fundamental principle in the lectures, be it in class or as we are on what I will refer to as her walking lectures. Yesterday (the 11th as I am writing this now on the morning of the 12th), we took the tram to Kazimierz, the Jewish quarter of Kraków. The history of this quarter goes back to the 13th century, when Kazimierz, the Great decided to provide a space the Jewish population in Kraków. This is no minor thing when the Jewish people were already being banished from a large part of the Mediterranean basin for a couple of centuries. What continues to astound every one of us who learns about the Jewish plight of a two millennia is how this group of people is scapegoated time and time again because their religious practices that made them both more hygienic and more literate. Of course, what is most relatable to many of the students is that Schindler’s List, the seven time Academy Award winning film, was actually filmed in the streets and in some of the places we were walking. Again, it seems imperative to ask the question, how can such an amazingly advanced society like Germany make the decisions to not only discriminate, but systematically exterminate (kill) an entire group of people based on their faith? What happens when those who are in a position of power, either elected or appointed, are allowed to make statements that deride or affect an entire group, race, or gender? This is not something that should be simply ignored. What happens when that person or a particular party is allowed to legislate in a manner that deride or discriminate against said group, race, religion or gender? Again, if we have elected that person we are societally responsible for what happens. As we have listened to lectures and watched movies, we have been confronted with our own stereotypic views and attitudes. This is a good thing to learn. When lecturing, I tell my classes, the use of all stereotypes is negative. Furthermore, the practice of employing labels for those different from myself, or the propensity to do such, creates a division that limits or devalues that other person or group. Even if we see the other group as better or more capable. It seems this is what happened in the case of the Jewish people throughout Europe from as early as the 11th century. In terms of movies, students are struggling with this class a bit because the style and subject of movies here in Central Europe are so different that what we are used to watching in America. They are not slick and necessary as glitzy or amusing; they are much more realistic in their portrayal of everyday life, and when considering life in an Eastern-bloc country post WWII and under Soviet rule was a very different time. Then there is the issue of watching a movie that seems very dark and difficult in another language with subtitles. There is something very good in all of this because it compels us to think, to ask questions, to ponder the nature of the movie and to ask what it is we might learn. Art is not the same in all places, and art is a reflection of the culture that has created it. It is very interesting to me how we might go about analyzing a particular film for their final paper, which is what is required. Yesterday in class, you could begin to see some of the concern as they tried to wrap their heads around how to take on such an assignment. Indeed, there were questions on the question. During the last two days, conversations asking what has been the most significant or important learning moment up to this point has provided a number of enlightening answers. Not surprisingly students have noted just the scope of history and how it is so profoundly different from what they know. There is an enormous difference between something that is “old” from the 1790s and something that is “old” from the 1405. There is something different about almost everything they see or experience from breakfast to walking up the sidewalk. There are questions about the “why of something” most every moment of the day. Why do they just pull up on the sidewalk with their cars? Why do people actually wait for the walk sign to turn green? Why do we not drink the tap water here and why do so many people drink sparkling water (water with gas)? How much is that exchange rate? 4.2 to 1 or 25 to 1 or 292 to 1, mathematics and calculating becomes a required skill. Some students have taken time during free time to manage going out an exploring on their own, be it an extra day in Prague or a day trip to Warsaw. Some have found their ways to little places to eat and to sample local cuisine. Even those experiences create questions. 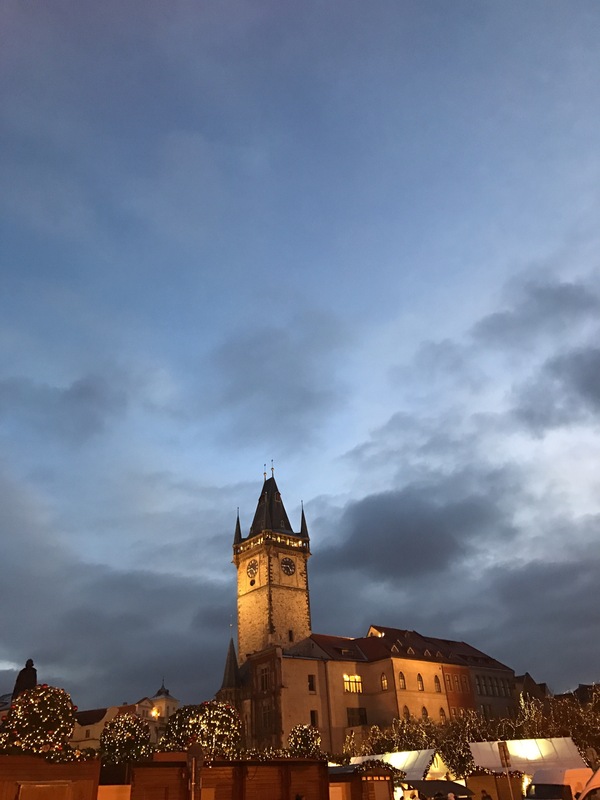 As we returned from Prague after the 6th of January, the Christmas Market and the hordes of people have gone, while there is still a presence on the town square, it is nothing like what they experienced during the New Years celebration. One of the things many students have commented on is what it might be like to come back in the summer. I too believe it would be beautiful. It is interesting to see how the personality of each group is different. This is the third year I have been around some of the students and the difference in both numbers as well as the difference in composition creates for new experiences. That is perhaps the most interesting thing for me. It is in the sitting and speaking in small groups that you actually get to understand how the students are learning and something about what they are learning. I always remember my first trip as a sophomore when I am conversing with them. I am still amazed at what Dr. John Nielsen did on a yearly basis by himself. He did not have another professor with him. There are three of us here this time and, at least speaking for myself, there are still times I feel stretched. What is a classroom? We are in a classroom that is older than any room I have ever been in, at least to do more than walk through. Is a classroom a place of desks, a projector, and now a computer? The inclusive classroom here has names like Dom Profesorski, Bydgoska, utica Garbarska, City Centre, ulica Golębia, Prague, Budapest, and Vienna. The professors are certainly the known ones, but also the people students interact on a daily basis from the clerk at Rossmans to the vendor at the Christmas Market. This year’s group has a number of personalities and there is a wonderful eclectic collective disposition. That is also part of the learning. How do you manage a small space in a foreign land with a person who reacts to the stresses of everything being different, everything being a question? For the first time in their lives, at least for most of them, they are “the other.” In spite of the fact that most of them do not know or realize it, that is the case. That is part of the learning that goes on behind the scenes. It is the thing that many might not realize for years. The reality of this trip, of this class, is that learning occurs 24/7. It is transformative. That is the beauty of it. No one can leave here unchanged. Questions will come to light and they will be pondered. Sometimes they will be pushed to the background, but they will reappear at another time and another place. Tomorrow students will board the bus for a trip to one of the places for me that has been most life-changing. They will go to Auschwitz, the death camp of all Nazi death camps. Fortunately, it will be a bit warmer than it has been much of the trip, but I know that both times I have been there, it was the coldest day of the entire journey. If that is the case tomorrow, it will be beyond brutal. I think last Wednesday was that day for me this year, at least I hope it was. As I am writing now, we have made it into yet another day. It is the 13th and about midmorning. Students have the morning off because they had two classes on Wednesday. As such it has been a bit quiet here, but I do not mind that solitude. Again, as I have noted in the past, I have learned to appreciate my alone-time. It offers a respite and the ability to reflect. That is rejuvenating for me . . . I know those earlier in my life would be shocked. Two years ago, after my first trip to Auschwitz, I could not get beyond the idea of evil that had occurred and how that was something that had occurred in a country with such a civilized and cultural history. Those ideas or questions still confound me. It will be interesting to see what their responses are when I see some of them later Saturday night. In the meanwhile, I am working on Polish and working on the possibility of affiliating and working with people in the multimedia area here at Jagiellonian. I am hoping to hear more over the weekend. When I am not doing that, I will be continuing to work on my Polish language tutoring and my own work for second semester that will be upon me before I know it. 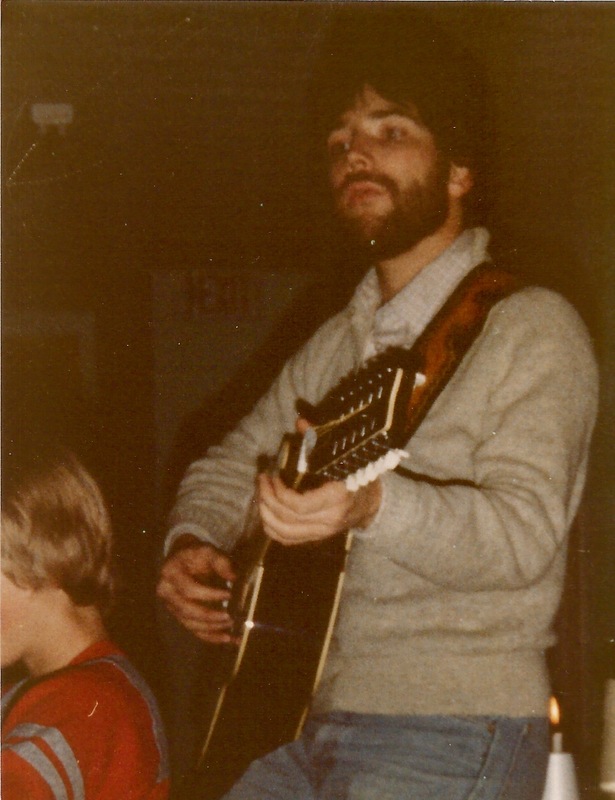 The picture is of me when I was a student at Dana College. I ran across it recently, it is quite resembles what I looked like when I came to Europe as a student with Dr. Nielsen. 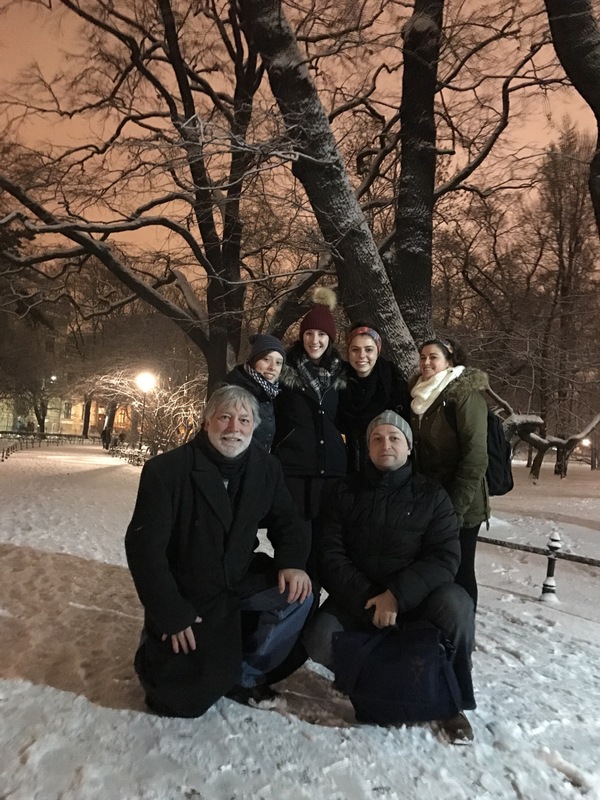 Since last writing, the itinerate Bloomsburg students and professors traveled by bus to the capital of the Czech Republic, Prague (Praha), and early this morning returned to Kraków. It was the coldest it has been for any of the 5 years (around -5F) and this morning in Kraków it is about -22C, which is about -8 on the Fahrenheit scale. That is quite cold for here. At breakfast this morning, our breakfast person, who was in his mid 20s, said this was the coldest winter of his life. While we know to bundle up in the cold, that process is very different when you are walking around a city center for 6 hours or so. It also has a different effect when you have been traveling on a bus for about 11 hours and you got up in the morning after a nap of about 3 hours or so. Yesterday as Dr. Polyhua and I were going to visit the Charles Bridge Museum, I got a senior discount on admission, so I am now officially able to note the importance of needing my sleep. We left Kraków on Thursday night about 7:00 p.m. on the bus Prague-bound. It is amazing how many game of 20 questions can be played between various groups of students on an 11 hour bus ride. After a quicker-than-most-wanted turnaround, we were up and out to visit the castle complex in Prague, where there is a metro and a subway, the exchange of money and a pretty tight schedule did not allow for availing ourselves to those options and so after a quick breakfast this past Friday morning, we forest-marched our way across part of Prague to meet our tour guide at Prague Castle (parts of it built as early as the 9th century) for a tour. We toured the castle, which had stricter than usual security because the President was on the grounds, managed to get across the bridge in spite of the swarms of people, toured various parts of the city, including the Jewish section . The picture gracing this posting is the Prague Castle taken from the market square at sundown. The temperature was not as chilly as this morning, but it was certainly cold. Twice we made a small detour to spend a bit more time inside; however, in spite of a few with sniffles and some a bit worse, it is a hearty bunch and we walked up and down the steep hills of Prague learning the complex and eventful history of this capital city of the very center of Europe. While in the past the tours have occurred over two days, this year our tours were back to back after a break for lunch because sunrise of Friday begins the Sabbath and most of the sites we would have visited the second day would have been closed. The good and the “less-than” for some tired a chilly explorers was Friday was long, but Saturday would be a more free day for small group discovery. Prague is a beautiful city, but it certainly caters to tourists and we happened to be there on Epiphany, the 12th day of Christmas, so the market square was still bustling on Friday with all of the things you could imagine, as well as a couple of surprises like three wisemen and real camels. In case you are unaware, which is not the case for many students, the Czech Republic is known for its beer, and particularly a pilsner, but between tours a quick lunch just outside the main square with 8 of us offered the possibility to sample both amazing food and beer. Spicy goulash with potato pancakes and a Kasteel Rouge (a cherry flavored beer that was not as fruity as a Lambić) was amazing. The fruit is hearty and flavorful, and while it might seem a bit heavy, managing to walk over 11 miles and up more than 20 flights of stairs burned off more calories than consumed, or at least my legs and the holes in my belt seem to indicate such a result. Experiencing the culture of the different places never grows tired, and as you listen to the dates of when things were established, you cannot help but be awed. When guides speak of things more recent, they are speaking about 3-5 centuries old; often when they speak of the old part of things, it is possible that it is as much as millennia since it was first started. Students are amazed by both the ability of most people to speak two or three languages as they are by the differences from country to country, which are in close proximity. That is what, of course in part, creates both the likelihood and necessity of being multi-lingual, but it also begins the process of understanding why students from Europe, who might study at Bloomsburg University, have a much more astute worldly view. As humans, in spite of our ability to see beyond ourselves, the hectic pace of living seems too often to close us off to the astounding opportunities for growth that cross our paths. Speaking with students, listening to their conversations, and watching their faces, taking trips like this, and many of the others offered by the Study Abroad Office, make it impossible for us to not be changed by the immersion of learning which occurs on a 24/7 basis. As noted in an earlier post, from street signs to conversations, from transportation to food, everything you take for granted on a daily basis as you walk from your dorm to the commons, from classroom to town, while attending school at Bloomsburg is called into question because you are mandated to rethink it all. That is the gift of taking the chance and traveling for a January term or summer session. This particular program, however, carries 7 credits, 6 of which come, as previously noted, from the second oldest university in Europe. The time spent on those credits is significant, and, for instance, before leaving on Friday paper outlines were returned, with comments from Dr. Orla-Bukowska about their proposals. Another round of consideration with one of the three of their Bloomsburg professors, and students were given their outlines back as we sat in a rest-stop on the Czech and Polish boarder. The classroom is not merely four walls, the classroom is daily living and the experiences crammed into each 24 hour period. Managing things like colds, sniffles, or even worse than what seems to be a common cold sometimes means a person takes a day off and sleeps to regain their energy and there has been some of that, particularly over the last couple of days. Again, those events are not uncommon because the days seems to blend together and the temptation to stay up and experience every minute of the day is hard to ignore. The consequence for many, even when we do go to bed at a reasonable time, is the days blend together. I have had to think more than once, and ask myself thoughtfully, what day is it? One of the things an individual traveling abroad will quickly learn is to make sure you are ready for the unexpected. Because we had a bit more free time yesterday, and because of the cold, the decision was made to return to Kraków a couple of hours earlier than the original itinerary had noted. This was to help a couple of those who were still trying to shake whatever bug was thumping them to get a bit more sleep back in our dorms in Poland. Things were proceeding nicely, including even a rest stop at a McDonalds (I do not think I have ever seen so many Big Macs and French fries in one place and I am guilty of ordering both also – a first in all my times in Europe), and with about an hour to go and getting ready to go through a toll gate, a car attempted to pull into the lane occupied by our bus. In fact, this vehicle tried it numerous times. Finally, the occupants of the car came up with some hair-brained idea they could push the bus out of the way with their little Volvo. Needless to say, the plan was misconceived and after their mirror hit the bus, they pulled in front of the bus and the father in the vehicle got rather animated in his responses to the driver (and anyone else who might care to listen). Long story, short: for the next two and a half hours after wreckers, Policija, watching the SD card that buses have loaded for just such things, and a very angry family in a Volvo, in spite of their own stupidity, we were finally on our way. Our bus driver, Marek, was calm, collected and professional the entire time. It is the second year he has driven for us. 40 students actually cheered him as he was finally able to take us on our way. However, so much for getting back earlier than our proposed itinerary. By the time we were back in either Bdygoska or Dom Professorski, it was almost 1:30 a.m. As these trips and even my own first journey to Europe as a sophomore in college has taught, on any study abroad trip is it is impossible to plan for every contingency. So today is a free day, at least as far as scheduled events. Some will sleep a bit more; some will work on their papers and their reaction papers that are due for both classes, and some will visit places in Kraków like Schindler’s Factory, which is now a museum. I will work on my Polish language lessons, and syllabi and BOLT for my next semester classes, all of which are coming much too soon. Today we have been transported from our dormitories to the 19th century and to consider once again the complex question of Judaism and how so many Jewish people are in Poland by the beginning of the Second World War. The understanding of Jewish identity in Western and Eastern Europe is dissimilar and the way Jewish people managed their identity in the two sides of the European continent is also varied. I remember last year when I first sat in on this amazing class; the breadth and depth of knowledge of Dr. Orla-Bukowska is beyond compare. She is a professor, respected world-wide for her knowledge of Jewish history and their unparalleled ability to maintain their identity in spite of being homeless for almost two millennia. It is wonderful to listen to the passion with which she speaks and the willingness she demonstrates in going above and beyond to share what she knows. As I listen to students asking their questions, it is evident that many of them are just as astounded by what is happening in class. In addition, the comments as they are walking the streets of Kraków, sitting at dinner, grabbing a cup of coffee, or gathering together in the two dormitories are just as appreciative. The energy she exudes in class, or when she stayed up until 3:30 this morning to turn around their proposals in a matter of a couple days further demonstrates just how fortunate students are to be in her presence. The complexity of the Jewish question, for many, returns them to Hitler’s invasion of Poland in September of 1939, but that is all most Americans, as well as American students, know. Perhaps a few have taken the time to go to the United States Holocaust Museum in Washington, D.C. and perhaps a few more have traveled to Europe and visited one of the main concentration camps like Dachau or Buchenwald, or an extermination camp such as Auschwitz, but there is little knowledge of, and even less appreciation for, the plight and mistreatment of the Jews that can be traced to Biblical times. As you might be a person reading this, how many of you, for instance, were aware that the Jewish people were expelled from England as early as 1290 or from Spain in 1492 and Portugal in 1497? How many of you know that in many places throughout the Mediterranean basin Jews were forcefully removed and often blamed for the Bubonic Plague, the Black Death that decimated Europe in the 1350s and beyond? How many of you realized that in 1939, 20% of the Jewish population in all of the world lived in Poland? These are some of the major facts students are learning in this class, but the tapestry that Dr. Annamaria, as some will call her, creates is far more beautiful that the coat of many colors. Tonight (and it is late afternoon on the 5th as I write this), we will be traveling by bus to Prague, where we will spend the next couple of days. The bus trip there (and back) is long, but Prague is a beautiful city, and one that was spared much of the carnage and destruction of WWII. The history of the Jews in Prague is also significant and most of Saturday will be spent in the Jewish Quarter. Even that term has a significant and complex history. There is nothing about Jewish history that is simple; and there is nothing about the Jewish people, at least for me, I do not find amazing. After returning from Prague, student will also visit the Jewish Quarter here in Kraków, which is where Schindler’s Factory was located. Relatively close by, students will visit Auschwitz during their final weekend here in Poland. There are no words to describe either the museum, which is now housed in Schindler’s Factory nor Auschwitz, where more that 1.3 million people were exterminated in a span of four years, and most of them within the first 24 hours of arriving in this place of death. That is more difficult for me to fathom is that we did not learn from Auschwitz, genocide and ethnic cleansing and hate have not disappeared from this world. In fact, it seems the renewed sense of nationalism that has reappeared throughout the world does not bode well for trust and mutual respect. That too is a complex question. It is ironic for me that the first time I came to Europe, I was a student just as the 40 who are here now. It was also during January and Ronald Reagan was being inaugurated as 40th president, it was also a tumultuous time in American politics, the hostages would be released from Iran as he was sworn in as an affront to Jimmy Carter. The world was in an economic downturn. Inflation was almost 11% and interest rates were almost 16%, a far cry from where we are now. Gas had gone above a dollar a gallon a year or two before, but had somewhat stabilized. Our dependence on foreign oil was strangling our economy and it is somewhat interesting that someone who came from Hollywood became president. It was the last time such an outsider somehow got to the White House. It was also a bit surprising for me to realize we are only 5 presidents beyond that time and it is 36 years later. Today in class we spoke about the period that Poland was flourishing and independent. It was a period between the wars. As I have spoken with students here on the trip, it is interesting how often the election of the fall still comes up in their conversations. I have often noted, even before the election, that I was saddened by the fact that the tenor of the election was so embarrassing for their first foray into presidential voting. It reminds me once again of my initial title; the world is always complex. It is good to try to simplify at times; it is good to step back, but critical and thoughtful reflection will always face complexity honestly. That is a foundational part of this trip. From managing money to managing time, from attempting to understand, be it class or that other language, perhaps one of the most important lessons of the trip for all of us is being willing to open our minds and our hearts to the other. As we begin a New Year, 40 students from Bloomsburg are being inundated with options to learn. It is a complex process, but a gratifying one. It is a once-in-a-lifetime, and you’ll-never-forget experience. Even as the oldest person on the trip, I am still learning, and it is not always simple. Thanks for reading and soon off to Prague. Alexandra Miller, a senior honors student who is studying ASL and Spanish, is jointly working on today’s entry to provide a dual perspective on this trip to the cities of Eastern and Central Europe and the time spent in classes at the Polish School of Language and Culture. 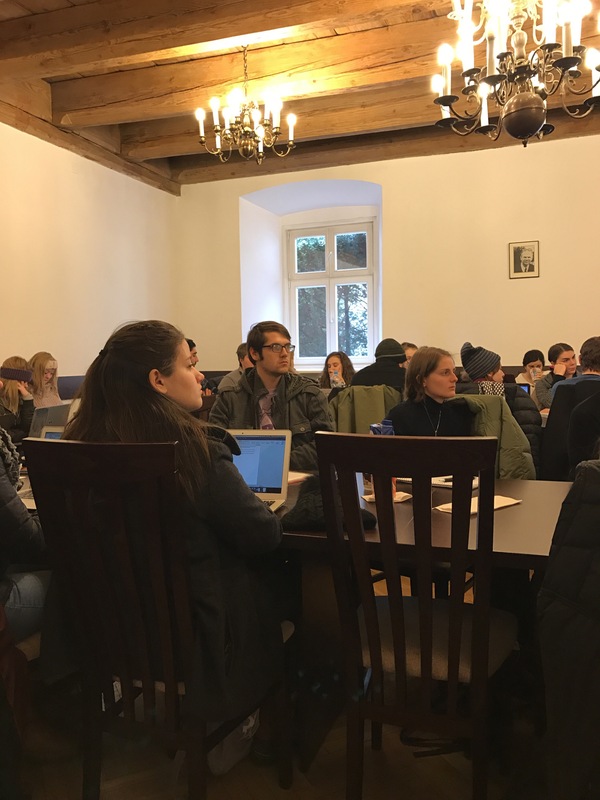 This is the 5th year for the joint venture between here and Bloomsburg University, and the number of students traveling to receive credits for their class work at Jagiellonian University has grown to 40, after a first year of about a dozen. Bloomsburg’s Dr. Mykola Polyuha has almost single-handedly grown this amazing venture in terms of contacts and logistics, and the Global Studies office has provided invaluable assistance. This year a significant continent of honors students are also on the trip. The first thing many might ask is if they are required to speak Polish. While the classes are taught in English learning how to say things like good morning (dzień dobry), thank you (Dziękuję) and thank you (nie ma za co) are a good place to begin. Having some background in another language is certainly helpful according to Alex, who speaks both Spanish and German. She finds herself wondering about the connections between the different families of languages. Whatever the case, you will certainly be able to manage in English in major cities. It is always strange to not be able to read signs or understand things in the grocery store without a picture; however, when the Polish złotys are about 4.23 to $1.oo, there are two things happening. If currency conversion is something new, it takes some time to get a handle on it, but this exchange rate makes being in Poland very affordable. Alexandra, Clarissa, and I had dinner and a drink along with mineral water for about 30.00 total between the three of us. So . . . finding something to eat at a great price is commonplace. Second, when the Christmas Market is still in full force, the food at the street vendors is beyond anything you might ever imagine at the Bloomsburg Fair, and, not to sound snobbish, both better and cheaper. The Christmas holiday and New Year’s Eve are quite an experience. First, Europeans celebrate the 12 days of Christmas for exactly what it is: the Christmas season. Encountering one of the most important events of the church year in a country that is 95% Roman Catholic certainly is different than the typical American season. Again, in our conversation today, a reflection of this difference was aptly stated as “while Christmas in America is about commercialism, Christmas in Europe is about culture.” People from around the world, but even more so certainly from around Europe come to Kraków for New Year’s Eve, cramming 150,00 to 175,000 revelers into the main town square. The friendliness of people and the number of languages you will hear screaming out Happy New Year in this relatively small space is unlike anything I have ever experienced and students each year walk away with life-long memories. However, there is more to this experience than food and people. Most days after breakfast, the 40 students and 3 faculty here this year gather at the university for two classes, which meet for about 3.5-5 hours almost daily, including some Saturdays. The first class, starting mid-morning is titled History 405 Jews of Europe and is taught by Dr. Annamaria Orla-Bukowska, a world renown social anthropologist for her work in this area. Her encyclopedic knowledge of the Jewish question will astound and captivate you. The second class, titled Russian 214 East European Film, Literature, and Culture is perhaps the more difficult class as the 16 films watched both inside and outside of class are in foreign languages (mostly Slavic), with subtitles. As we spoke at dinner among ourselves, the work to wrap our heads around what some of the films are saying or what we should understand certainly takes work. Certainly some of the challenge is language, but the film genre is so different from the typical RomCom or Drama/Action films to which we are generally accustomed, these films are realistic and much darker than some might find even comfortable. The professor for this class, Dr. Maciej Stroiński, is both avant garde and brilliant. He is considered to be one of the best film critics in all of Europe. Pushed to think a bit differently than many of the classes taken back in their own majors, students are asked within a few days to come up with a significant paper proposal for the Jews of Europe class, with at least a pretty thoughtful outline. In addition, they are to write two critical reaction papers. After returning to the states, there will be a 8-10 page paper due by the end of the month. Similar requirements are due in the East European Film, Literature and Culture course, with a major paper due at the end of the month. The film writing is perhaps the most difficult because very few students understand the significance of a post-Soviet understanding of the an individualistic or transnational Eastern Europe. From my experience last year, however, both professors are simultaneously academic and kind in their responses to the Bloomsburg students. It is interesting to me as a writing professor to see how students, most of whom are strong students in their majors back at Bloomsburg (if I am not mistaken, all students on the trip this year have GPAs above 3.0), work to manage the compact schedule of academic requirements while trying to experience the remainder of the immersion called Kraków or Prague has. In addition, there is the reality that coming to Europe and spending time is a literal walk through a history book. For instance, Jagiellonian University was established in 1364. That means it has a few centuries on any university in North America. Trips to the Wieliczka Salt Mine in the next day or to the Jewish Quarter, Schindler’s Factory or Auschwitz are not something you ever forget. Too many times students believe that study abroad is too expensive or not worth the effort, but as the three of us spoke at dinner this evening, nothing could be farther from the truth. As I have walked around this city for the third time, and am working on arrangements to come back for an extended period, I have been once again reminded that there is so much that is happening in the world that matters, but we have little to no clue about. What has happened in our own recent politics, or perhaps not as recent as we might think, actually mirrors much of what has happened in a number of countries here in Europe, and while I am certainly not a social scientist, nor a political scientist, it seems that our sort of xenophobic/right-leaning/nationalism is the consequence of something we use every day. Globalism is more than an economic phenomena; it is a social phenomena and the ability to reach across borders, continents, and time zones effortlessly has had consequences unforeseen and perhaps unimagined. That might be one of the most important things that students on the trip might learn. Whether it be Budapest, Vienna, (two cities added to this years itinerary), Kraków or Prague, most people are merely trying to make their way in the world, but a world that finds people from different cultures, languages, and religions reaching out on a New Year’s Eve or on an U-Bahn, or standing on the corner hoping for a world with less violence and more understanding. Sharing dinner with students who appreciate another language, having breakfast with our Russian Fulbright Scholar (did you know we had one at Bloomsburg right now?) or listening to students who are studying Russian are great reminders that the world is much larger than the drive from your home to school and back, or from home to a major city. We live in a complex and amazing world. 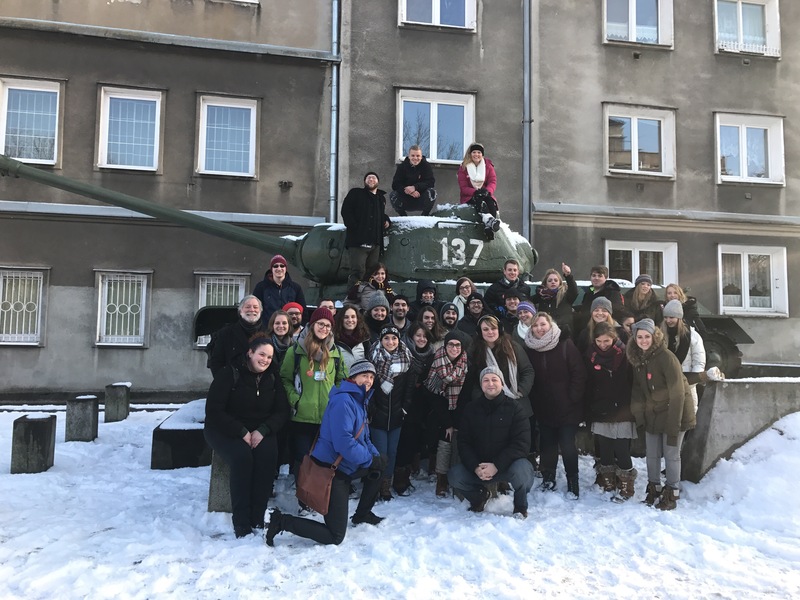 40 students and 3 faculty are living that reality each morning as they face both experiences and classes during this Winter break in Poland. Dziékujé za przeczytanie i pozdrowienia z Polski.